BRUNSWICK, Ohio--(BUSINESS WIRE)--When it comes to getting kids to eat healthier, the solution might be as simple as making fresh, healthy food options more readily available. 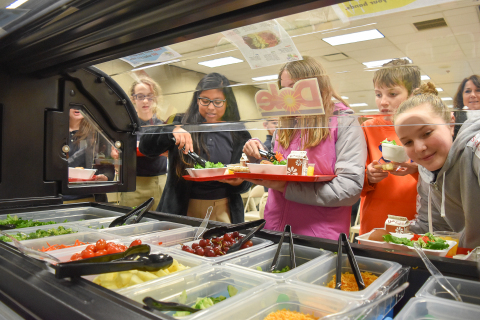 As part of an initiative committed to increasing healthier food options for students, Dole Food Company and local grocery retailer Marc’s have partnered to donate a new salad bar to Saint Ambrose Catholic School in Brunswick, Ohio. The salad bar, unveiled at a dedication ceremony today in the school’s cafeteria, is the first to be implemented by the Catholic Diocese of Cleveland, and will feature a wide array of fresh fruits and vegetables to boost nutritious choices for students at breakfast and lunch. The salad bars were arranged through a partnership with the United Fresh Start Foundation to support Salad Bars to Schools, a program which has donated salad bars to more than 5,000 schools over the last seven years and is benefitting 3 million children with increased access to fresh produce. The United Fresh Start Foundation works with the produce industry, foundations and allied businesses to support salad bars for schools nationwide, promoting salad bars as the most effective strategy for increasing children’s produce consumption at school. “We are pleased to assist Saint Ambrose Catholic School to begin implementing salad bars in this region of Ohio. Kids like fresh fruits and vegetables and when given the opportunity to make their own choices from a school salad bar, they will select and eat more fresh produce,” said Tom Stenzel, President and CEO, United Fresh Produce Association. “Salad bars are a visual representation of healthy school meals, and this much-needed equipment is often a ‘conversation starter’ amongst students, school administrators and parents about the importance of eating more fresh fruits and vegetables for better health. Corporately headquartered in Parma, Ohio, Marc’s opened its first store in 1978 and has continued to grow ever since. With 58 stores throughout Ohio, Marc’s carries name brand merchandise in the food, health & beauty, produce, meats and cheeses, dairy, frozen and general categories. Many stores also have bakery departments, cold cut counters and pharmacies. Marc’s continues to grow and expand and be the leading deep discounter in Ohio. For more information, visit www.marcs.com. The United Fresh Start Foundation is a 501 (c)(3) not-for-profit organization focused exclusively on increasing children’s access to fresh fruits and vegetables. Affiliated with the United Fresh Produce Association, the Foundation is committed to helping today’s kids achieve the public health goal to make half their plate fruits and vegetables in order to live longer and healthier lives. The Foundation works to create an environment in which kids have easy access to high-quality, great-tasting and affordable fresh fruits and vegetables, whenever and wherever they are choosing snacks or a meal. More information at: www.unitedfreshstart.org. Saint Ambrose Catholic School is a K-8 grade school located in Brunswick, Ohio, and is part of the Catholic Diocese of Cleveland. Saint Ambrose School is the first STEM school in Medina County, and one of the first of its kind in the state of Ohio. As part of their ongoing commitment to providing “Everything for every student, every day”, they are the first school in the Catholic Diocese of Cleveland to offer a salad bar to students as part of their daily nutritional lunch program. For more information, including enrollment opportunities for 2018-2019, please visit www.SaintAmbroseSchool.us. Dole Food Company and Marc's Stores donated a new salad bar to Saint Ambrose Catholic School in Brunswick, Ohio, to encourage healthier food options.